Harvest Health: Tea or coffee? If you drink tea or coffee on a daily basis, do you know how much caffeine you consume? The information below may help you work it out. A 250ml cup of instant coffee contains 80mg of caffeine. An espresso contains 107mg. A 250ml cup of tea contains 27mg of caffeine. You may be surprised to learn that green and black tea are produced from the same plant - black tea is made from oxidised leaves, whereas green tea leaves are not oxidised at all. The amount of caffeine in green tea is generally lower than in black tea. The overall amount of caffeine in a cup of tea will depend, however, on how long you leave the tea to brew. If you are not pregnant or breastfeeding, the general guidelines on caffeine consumption are quite high - up to 500 - 600mg a day. I would argue that this is too high, and many people would experience symptoms of anxiety well below this limit. 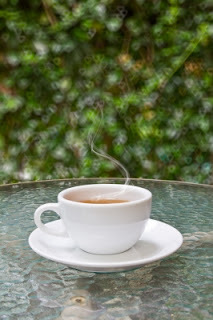 A safer guideline is to stick to no more than 1 cup of coffee a day, or 2 - 3 cups of tea. It is also important to have regular caffeine free days so that you are not creating a dependency. It's important to remember that caffeine can have many unwanted side effects such as insomnia, nervousness, restlessness, irritability, digestive upset, fast heartbeat and muscle tremors. Some people are more sensitive to caffeine than others. If you're susceptible to the effects of caffeine, just small amounts - one cup of coffee or tea - may prompt unwanted effects, such as irritability and sleep problems. If you feel that you need to reduce your coffee or tea intake, there are many wonderful herbal teas to try. Choose a good quality organic loose leaf tea, make a pot, and enjoy the ritual and pause in the day that making a cup of health giving tea can bring.